-There is only one god. -Jesus is the son of god. -God is the creator of everything that exists. -Jesus is the only way to god. -Jesus died for the sins of each and every person in the world. -Jesus resurrected from the dead. Christians are on the verge if extinction in Iraq is the current event that I'm using. Isis is having Christians run for their lives out of Iraq, mostly in Baghdad.Christianity has been attacked for a long time in Iraq but it's happening more from what happened over the summer. Over the past 10 years the amount of Christians in Iraq have gone from a couple million to the thousands. 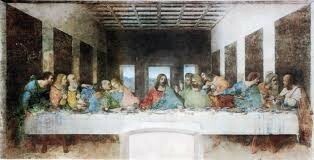 This is a picture of the last supper which was before Jesus' last meal before he was crucified. It was made by Leonardo Da Vinci.